At Jaguar Colorado Springs we only have a few Certified PreOwned vehicles left in our pre-owned inventory! 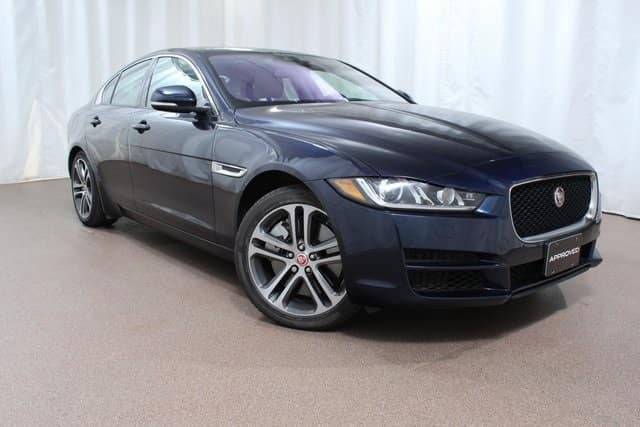 That includes this luxurious 2017 Jaguar XE sedan, which has only 4,000 miles on it! Currently on special offer, you can purchase this gorgeous sedan for $10,000 less than the suggested retail price – getting it at just under $40,000! Equipped with a 3.0L V6 supercharged engine, you can expect an impressive estimated 20 MPG city/29 MPG highway fuel economy. Plus, you can look forward to some great features as well including blind spot monitor with close vehicle sensing, power moonroof, headlight washers, reverse traffic detection, Meridian 380W Sound System w/11 Speakers, and front and rear parking aids. Plus, there are so many other innovative and luxury features for you to enjoy along with the super performance of this XE 35t. So stop into Jaguar Colorado Springs today to check out this beautiful 2017 Jaguar XE 35t Premium AWD sedan. Our friendly sales staff can tell you all about the many luxury features, or ask about a test drive to experience the impressive performance and comfort of this Jaguar sedan.